LAM – Linhas Aereas de Mocambique (Maputo) and Boeing (Chicago and Seattle) announced an order for three Next-Generation 737-700 airplanes. The order, valued at $228 million at list prices, includes purchase rights for three additional Next-Generation 737s. 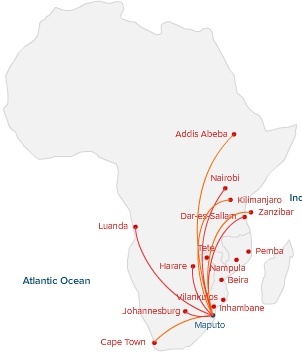 The order, formally signed in November 2013 and was previously unidentified on the Boeing Orders & Deliveries website, is part of the Mozambique flag-carrier and the country’s Ministry of Transport and Communication’s long-term strategy to increase flight frequency and provide greater route flexibility to and from the southern African nation. LAM – Linhas Aereas de Mocambique’s new 737-700s will be fitted with Boeing’s latest Performance Improvement Package (PIP), delivering an additional two percent improvement in fuel efficiency for what is already the most fuel efficient single aisle aircraft. The airplanes will also feature the popular passenger-inspired Boeing Sky Interior, with modern sculpted sidewalls and window reveals, LED lighting that enhances the sense of spaciousness and larger pivoting overhead stowage bins. 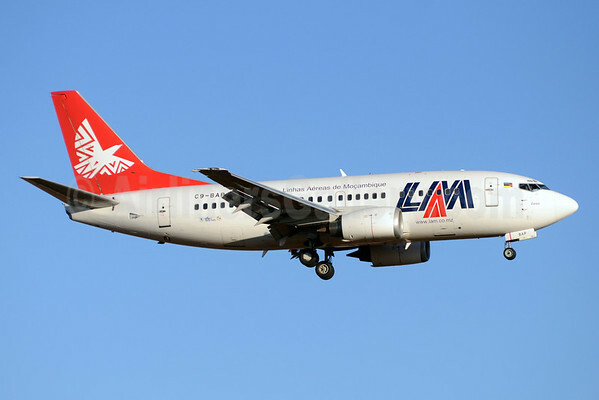 Based at Maputo International Airport in Mozambique’s capital city, LAM – Linhas Aereas de Mocambique currently operates flights domestically and regionally, across southern Africa with a fleet that currently includes Boeing 737-500s, and other smaller regional aircraft. Copyright Photo: TMK Photography/AirlinersGallery.com. The new Boeing 737-700s will replace the older 104-seat 737-500 type. Boeing 737-53S C9-BAP (msn 29074) arrives in Johannesburg. This entry was posted in LAM-Linhas Aereas de Mocambique and tagged 29074, 737, 737-500, 737-53S, 737-700, Boeing, Boeing 737, Boeing 737-500, C9-BAP, JNB, Johannesburg, LAM, LAM-Linhas Aereas de Mocambique, Linhas Aereas de Mocambique on February 5, 2014 by Bruce Drum. airBaltic (Riga) will launch a new route tomorrow (March 31) between Riga and Tromso in northern Norway. The new route will be operated four times a week. This entry was posted in airBaltic and tagged 29075, 737, 737-500, 737-53S, airBaltic, Antony J. Best, Boeing, Gatwick, LGW, London, YL-BBD on March 30, 2009 by Bruce Drum. The SAS Group (Stockholm) is planning to pump in $9.24 million for Estonian Air (Tallinn) to improve the liquidity of the flag carrier. This comes as SAS has previously stated it would like to divest its 49 percent share of the company. This entry was posted in Estonian Air, SAS Group, Scandinavian Airlines-SAS and tagged 29074, 737, 737-500, 737-53S, Boeing, ES-ABH, Estonian Air, Keith Burton., SAS Group, Scandinavian Airlines-SAS, SEN, Southend on February 27, 2009 by Bruce Drum.